Global Sack Kraft Paper Market – Industry Analysis and Forecast (2018-2026) – by Grade, Packaging, End-use industry and Region. Home » Reports » Consumer Goods & Services » Global Sack Kraft Paper Market – Industry Analysis and Forecast (2018-2026) – by Grade, Packaging, End-use industry and Region. Global Sack Kraft Paper Market was value US$ 9.2Bn in 2017 and is expected to reach US$ 12.5Bn by 2026 at a CAGR of 3.9%. The objective of the report is to present a comprehensive assessment of the market and contains thoughtful insights, facts, historical data, industry-validated market data and projections with a suitable set of assumptions and methodology. The report also helps in understanding global Sack Kraft Paper market dynamics, structure by identifying and analyzing the market segments and project the global market size. Further, the report also focuses on the competitive analysis of key players by product, price, financial position, product portfolio, growth strategies, and regional presence. The report also provides PEST analysis, PORTER’s analysis, and SWOT analysis to address questions of shareholders to prioritizing the efforts and investment in the near future to the emerging segment in the global Sack Kraft Paper market. The major driver of sack Kraft paper is that it can be produced using a wider range of fibres. Variety of woods can be used for the sack Kraft process. This factor is expected to facilitate the growth of the global Kraft papers market, over the next decade. Also, Kraft papers are eco-friendly, provide excellent product packaging, and are easy to stack and above all, they are easy to dispose of. 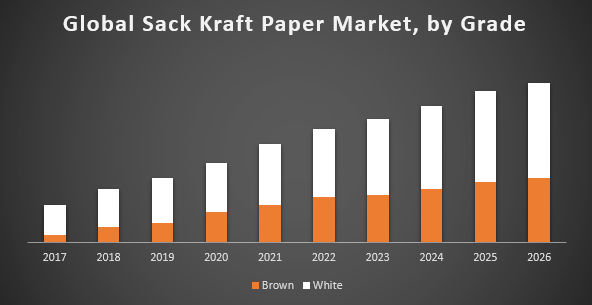 These factors are expected to boost the sack Kraft papers market during the forecast period. The increasing demand for biodegradable packaging, due to the use of environment-friendly material with properties for example porosity, durability, extensibility, and printability are a factor predictable to drive the growth of the market. Many industries including food & beverage, electronics, cosmetics, personal care, textile and others sack Kraft papers as packaging products. This is expected to drive the global sack Kraft papers market over the next few years. Sack Kraft papers are recyclable and can be used further. Kraft papers provide lightweight packaging and are easy to transport. In end-use industries, cement and building materials segment accounted for the largest market share, due to rapid growth in construction and increasing demand for building materials. Many properties are considered while choosing the paper grade for construction of cement sacks, as it must be able to provide high strength. White sack Kraft paper segment accounted for to the largest market share in 2017, due to properties of white paper to enable halftone printing and enhance the printing appearance compared to brown sack Kraft paper. Region-wise, the Asia Pacific was the dominant region in the global sack Kraft paper market in 2017, valued at US$ 3,314.74Mn and is anticipated to continue its dominance during the forecast period. The market in the Asia Pacific is driven by growing construction doings in India and China. According to India Brand Equity Foundation (IBEF), a part of the Department of Commerce, Ministry of Commerce and Industry, Government of India, the Indian construction industry is projected to increase to a value of US$ 5Bn by 2026 and cement production capacity is expected to reach 560 million tons by 2026. • The Mondi Group plc. • Horizon Pulp & Paper Ltd.
16.3.2. The Mondi Group plc. 16.3.10. Horizon Pulp & Paper Ltd.